IdFix identifies errors such as duplicates and formatting problems in your directory before you synchronize to Office 365. To finish this task successfully, you should be comfortable working with user, group, and contact objects in Active Directory. Run directory synchronization without running IdFix. You can synchronize your directory without running the IdFix tool, but we don't recommend it. Fixing errors before you synchronize takes less time and often provides a smoother transition to the cloud. Hire a consultant. Getting expert help can get your users up and running quickly and your directory synchronized. The easiest way to get IdFix up and running is to install it on a computer that is joined to your domain. You can run it on the domain controller if you want, but it's not necessary. The computer where you install IdFix needs to be joined to the same Active Directory domain from which you want to synchronize users to Office 365. The computer also needs to have .NET Framework 4.0 installed. If you are running Windows Server 2008 or Windows Server 2012, then .NET Framework is probably already installed. If not, you can download .NET 4.0 from the download center or via Windows Update. The user account that you use to run IdFix needs to have read/write access to the directory. If you aren't sure if your user account meets these requirements, and you're not sure how to check, you can still install and run IdFix. If your user account doesn't have the right permissions, IdFix will simply display an error when you try to run it. Log on to the computer where you want to install the IdFix tool. Go to the Microsoft download site for the IdFix DirSync Error Remediation Tool. On the WinZip Self-Extractor dialog box, in the Unzip to folder text box, type or browse to the location where you want to install the IdFix tool. By default, IdFix is installed into C:\Deployment Tools\. Using an account that has read/write access to the directory, log on to the computer where you installed IdFix. In File Explorer, go to the location where you installed IdFix. If you chose the default folder during installation, go to C:\Deployment Tools\IdFix. By default, IdFix uses the Multi-Tenant rule set to test the entries in your directory. This is the right rule set for most Office 365 customers. However, if you are an Office 365 Dedicated or ITAR (International Traffic in Arms Regulations) customer, you can configure IdFix to use the Dedicated rule set instead. If you aren't sure what type of customer you are, you can safely skip this step. To set the rule set to Dedicated, click the gear icon in the menu bar and then choose Dedicated. By default, IdFix searches the entire directory for errors. Depending on the size of your directory, running the query can take a while. You can watch the progress at the bottom of the tool's main window. If you click Cancel, you'll need to restart from the beginning. After IdFix completes the query, you can go ahead and synchronize your directory if there are no errors. If there are errors in your directory, it is recommended that you fix them before you synchronize. If you want more specific information about types of errors and recommendations about the best way to fix each of them, see the links at the end of this topic. While it is not mandatory to fix the errors before you synchronize, we strongly recommend that you at least review all the errors returned by IdFix. Each error is displayed in a separate row in the tool's main window . If you agree with the suggested change in the UPDATE column, in the ACTION column select what you want IdFix to do to implement the change and then click Apply. When you click Apply, the tool makes the changes in the directory. You don't have to click Apply after each update. Instead, you can fix several errors before you click Apply and IdFix will change them all at the same time. You can sort the errors by error type by clicking ERROR at the top of the column that lists the error types. One strategy is to fix all the errors of the same type; for example, fix all the duplicates first, and apply them. Next, fix the character format errors, and so on. Each time you apply the changes, the IdFix tool creates a separate log file that you can use to undo your changes in case you make a mistake. 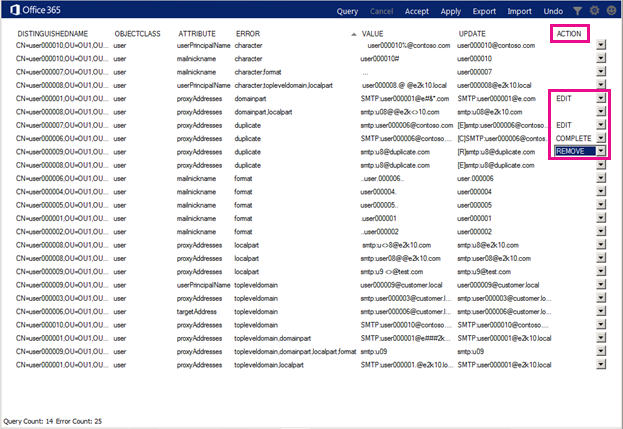 The transaction log is stored in the folder that you installed IdFix in. C:\Deployment Tools\IdFix by default. After all of your changes are made to the directory, run IdFix again to ensure that the fixes you made didn't introduce new errors. You can repeat these steps as many times as you need to. It's a good idea to go through the process a few times before you synchronize. I want to refine my search or dig deeper into the errors, what else can I do with IdFix? Prepare directory attributes for synchronization with Office 365 by using the IdFix tool . After you have installed the tool, jump to this topic for more detailed instructions about running the tool, common errors you will encounter, suggested fixes, examples, and best practices for what to do when you have a large number of errors. For more information, see the lesson Install and use the IDFix tool, brought to you by LinkedIn Learning.